Former Strikeforce top women’s welterweight contender, Roxanne Modafferi, has been cut off by the promotion after being slammed by Sarah Kaufman. Modafferi’s Strikeforce debut came last year during a Fedor vs Rogers bout, where she had a rematch against Marloes Coenen. Last 2007, she has beaten the current women’s welterweight champion in Japan via split decision. However, Modafferi loss to Coenen early in the first round via armbar during their second meet. Modafferi took two bouts outside Strikeforce then, including a rematch against Tara LaRosa last May. Roxanne Modafferi ended LaRosa’s 15-fight winning streak via split decision, which earned her a tittle shot in Strikeforce. Unfortunately, Sarah Kaufman knocked her out after executing a highlight-reel power slam in the third round. 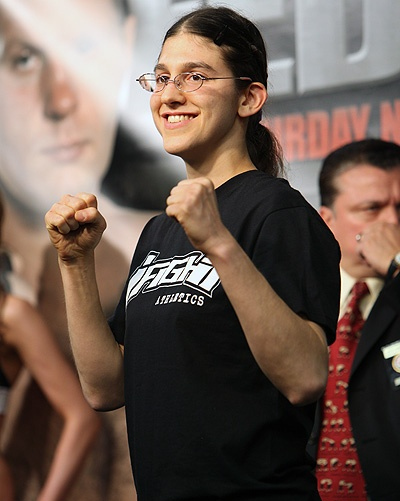 Modafferi’s loss to Kaufman brought her out of Strikeforce.